Discovering the Fundamentals of Statistics by Dan Larose is the ideal brief introductory statistics text that balances the teaching of computational skills with conceptual understanding. 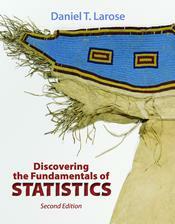 Written in a concise, accessible style, Discovering the Fundamentals of Statistics helps students develop the quantitative and analytical tools needed to understand statistics in today’s data-saturated world. Dan Larose presents statistical concepts the way instructors teach and the way students learn.